Charms There are 113 products. Black bead with silver carved circle pattern. Fits 550 paracord. 5.5mm hole Please note price shown is for a single bead/Charm. 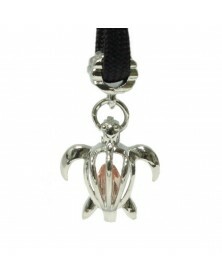 Peach Crystal Sea Turtle Charm. Fits 550 Paracord 5mm hole. Please note price shown is for a single bead/Charm. 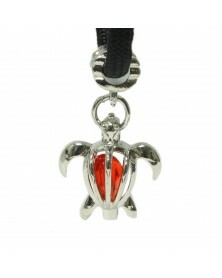 Red Crystal Sea Turtle Charm. Fits 550 Paracord. 5mm hole Please note price shown is for a single bead/Charm. 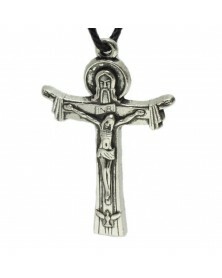 Metal Antique Silver Jesus on Cross (INRI) Charm. Fits Nano and Micro cord. 1.75mm hole Please note price shown is for a single Bead/Charm. 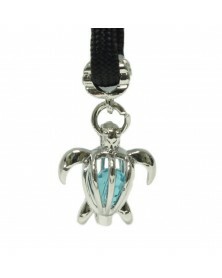 Light Blue Crystal Sea Turtle Charm. Fits 550 Paracord. 5mm hole Please note price shown is for a single bead/Charm. 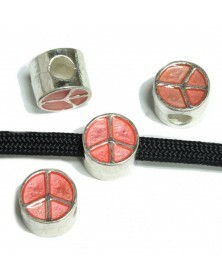 Metal silver charm that is a peace sign in pink, and is double sided. Fits 550 Paracord. Please note price shown is for a single Bead/Charm. 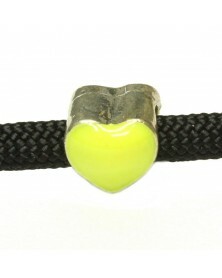 Yellow enamel Heart shaped Bead/Charm trimmed with Silver. Fits 550 Paracord. 5mm. hole Please note price shown is for a single Bead/Charm. Charm/Bead--Antique Silver double sided with Mother/Daughter stamped in the metal and Pink Rhinesontes highlighting the wings. Fits 550 Paracord. 5mm hole Please note price shown is for a single Bead/Charm. 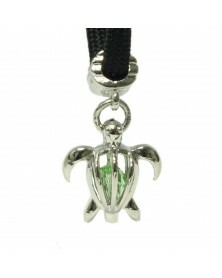 Green Crystal Sea Turtle Charm. Fits 550 Paracord. 5mm hole Please note price shown is for a single bead/Charm. Dangling Red Enamel Lip Charm suspended by a Silver stylish round bead. Fits 550 Paracord. 4.5mm hole Please note price shown is for a single Bead/Charm. 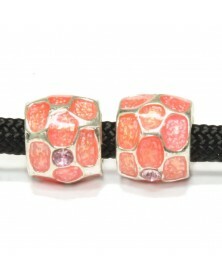 Pink bead with silver outlines and pink jewels. Fits 550 Paracord. 4.5mm hole Please note price shown is for a single bead. Dangling Pink HOPE ribbon charm. Fits 550 paracord. 5.2mm hole Please note price shown is for a single Bead/Charm. Silver metal in the shape of an Owl and double sided. Fits 550 Paracord. Please note price shown is for a single Bead/Charm. Antique metal sitting Dog Charm. Fits 550 Paracord. 4.7mm hole Please note price shown is for a single Bead/Charm. Silver toned Lock Heart. Keyhole imprint stamped into the Heart. Fits 550 Paracord. 5mm. hole Please note price shown is for a single Bead/Charm. Dangling Dark Pink Ribbon Charm. Fits 550 Paracord. Please note price shown is for a single bead/Charm. Silver metal heart shape with USA flag design. Fits 550 paracord. Please note price shown is for a single Bead/Charm. Colors of Spacer Beads will be random with an aurora borealis finish. Fits 550 Paracord. Please note price shown is for a 10 pack Bead/Charm. Metal Barrel Bead/Charm with stand out Pink Breast Cancer Awareness Ribbons all around it. They are backed with a Silver and Black background. Fits 550 Paracord. Please note price shown is for a single Bead/Charm. 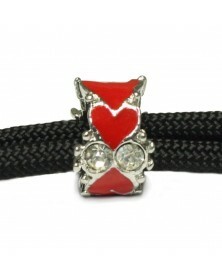 Round Silver Bead/charm with enamel Red Hearts and Clear Jewels. Will fit two 550 paracords. 7mm hole Please note price shown is for a single Bead/Charm. Metal Dragon Head Charm/Bead. Fits 550 Paracord. 5mm hole Please note price shown is for a single bead/Charm. 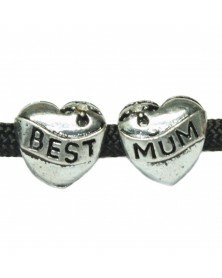 Metal Antique Silver Heart with "BEST" and "MUM" stamped in the metal on opposite sides. Each side also has a small flower and Clear Jewel. Fits 550 Paracord. 5mm hole Please note price shown is for a single Bead/Charm. 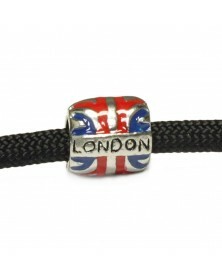 Metal Barrel Bead/Charm with Union Jack and LONDON stamped in a banner on both sides. Fits 550 Paracord. 5.5mm hole Please note price shown is for a single Bead/Charm. 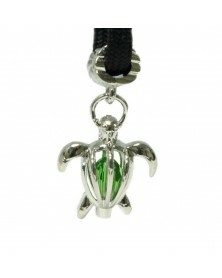 Metal Enamel Charm/Bead. Fits 550 Paracord. 4.5mm hole Please note price shown is for a single Bead/Charm. Metal Crown Charm. Fits 550 Paracord. Please note price shown is for a single bead/Charm. Antique Silver Metal double sided Heart with Antique Silver outline and raised letters saying "Cat Lover" on a tanslucent Imperial Red background. Fits 550 Paracord. 5mm hole Please note price shown is for a single Bead/Charm. Double sided silver metal white Butterfly with clear jewel on top. Fits 550 paracord. Please note price shown is for a single Bead/Charm. Dangling Dragonfly Lite Purple Charm. Fits 550 Paracord. Please note price shown is for a single bead/Charm. Round hero bead with red, white, blue and star in the middle. Fits 550 Paracord. Please note price shown is for a single Bead/Charm. Antique/Silver metal Ichthys Jesus Charm. A very traditional Christian symbol. Fits 550 Paracord. 5mm hole Please note price shown is for a single Bead/Charm. 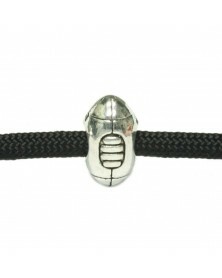 Metal Football Charm. Fits 550 Paracord. 4.5mm hole Please note price shown is for a single bead/Charm. Metal silver cat that is double sided. Fits 550 Paracord. 4.75mm hole Please note price shown is for a single Bead/Charm. 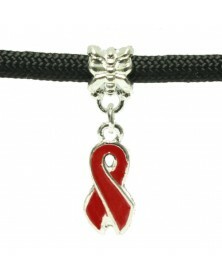 Dangling Red Ribbon Charm. Fits 550 Paracord. Please note price shown is for a single bead/Charm. Dangling Pink Ribbon charm. Good for Breast Cancer Awareness message. Fits 550 Paracord. Please note price shown is for a single bead/Charm. 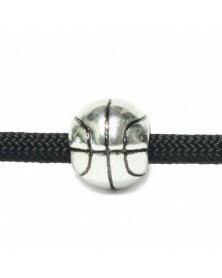 Antique/Silver Metal Basketball-shaped bead/charm. Fits 550 Paracord. Please note price shown is for a single Bead/Charm. Silver tone character bead. Fits 550 paracord. 5mm holePlease note price shown is for a single Bead/Charm. Antique bronze bead with a lion head on one side. Fits 550 paracord. 4.75mm hole Please note price shown is for a single Bead/Charm. Metal Antique Silver double sided European Style Cross with centered Jewel Charm/Bead. Fits 550 Paracord. 4.5mm hole Please note price shown is for a single Bead/Charm. Silver metal bible with cross on front and back. A traditional Christian symbol. Fits 550 paracord. 5mm hole Please note price shown is for a single Bead/Charm. Breast Cancer Awareness Ribbon Charm with feet dangling from A Silver Heart. Fits 550 Paracord. Please note price shown is for a single Bead/Charm. Round beads with Paw Prints in various colors encased in resin. (Can not choose color; New shipment included mostly dark blue pictured third from the right). Fits 550 paracord. Please note price shown is for a single Bead/Charm. Antique Silver Cross Charm with Clear Jewel in the Center. The Cross is a traditional Christian symbol. Fits 550 Paracord. 4.5mm hole Please note price shown is for a single Bead/Charm. Antique Bronze colored round peace sign bead. Measures 3/8” in diameter (10 mm). Zinc alloy. 5mm hole Please note price shown is for a single Bead/Charm. Antique Silver hexagon shaped bead with a Heart and Cross alternating pattern. I Love Jesus charm. The Cross is a Christian symbol. Fits 550 Paracord. Please note price shown is for a single Bead/Charm. Metal Awareness Ribbon Charm. Fits 550 Paracrod. Please note price shown is for a single bead/Charm. Antique/Silver metal Snowflake Charm/Bead. Fits 550 Paracord. Please note price shown is for a single Bead/Charm. 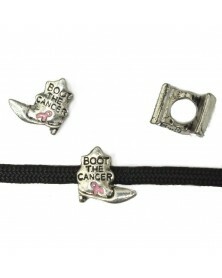 Metal Boot the Cancer Charm. Fits 550 Paracord. Please note price shown is for a single bead/Charm. Round Charm/Bead with Gold accents and a Clear Stone Cross on each side. Fits 550 Paracord. Please note price shown is for a single Bead/Charm. Broze hexagon shaped bead with a Heart and Cross alternating pattern. I Love Jesus Charm. The Cross is a Christian symbol. Fits 550 Paracord.Please note price shown is for a single Bead/Charm. Dangling Four Leaf Clover Charm outlined in Silver with very pretty Green Leafs. Fits 550 Paracord. 5.2mm hole Please note price shown is for a single bead. Orange bead with silver swirl pattern. Fits 550 paracord. Please note price shown is for a single Bead/Charm. White Ribbon Charm outlined with Silver. Fits 550 Paracord. Please note price shown is for a single bead. 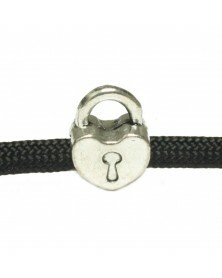 Silver round stopper bead with screw thread. Fits 550 Paracord. 4mm hole Please note price shown is for a single Bead/Charm. 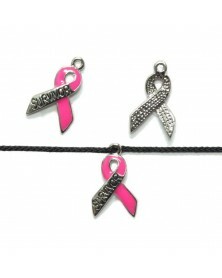 Dangling metal Breast Cancer Survivor Ribbon. This Ribbon works well with Micro and Nano Paracord. Please note price shown is for a single Bead/Charm. Silver Music Clef Charm/Bead. Fits 550 Paracord. 5mm hole Please note price shown is for a single Bead/Charm. Antique Silver Metal Dog with Bowl and Bone Charm/Bead. Fits 550 Paracord. 5mm hole Please note price shown is for a single Bead/Charm. Silver with Black Bead/Charm Square Dice Cube. Fits 550 Paracord. Please note price shown is for a single charm. Metal Palm Tree Charm. Fits 550 Paracord. Please note price shown is for a single bead/Charm. 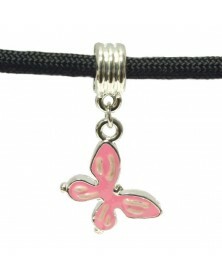 Dangling Butterfly Charm outlined in Silver with Pink Wings and White highlights. 4.5mm hole Please note price shown is for a single Bead/Charm. Metal Silver Charm with Dog Paw. Dog Mom stamped in Paw Pad. Fits 550 Paracord. 4.75mm hole Please note price shown is for a single charm. 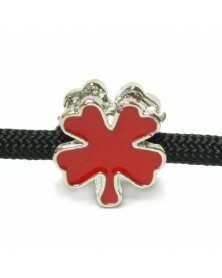 Red Enamel on a Four Leaf Metal Clover Charm. Fits 550 Paracord. Please note price shown is for a single bead/Charm. Ahoy Matey. Bronze Metal dangling Anchor. Good detail. Sailors have fun. Fits 550 paracord. Measures about 1 1/8 inch tall and 1 inch wide. Please note price shown is for a single Bead/Charm. Light green and Yellow round bead with swirl pattern. Fits 550 paracord. Please note price shown is for a single Bead/Charm. Barrel bead with Green awareness ribbon. Fits 550 paracord. Please note price shown is for a single Bead/Charm. Metal Charm Flower Cube. Fits 550 Paracord. Please note price shown is for a single bead/Charm. Antique/Silver metal Princess with Crown Charm/Bead. Fits 550 Paracord. Please note price shown is for a single Bead/Charm. 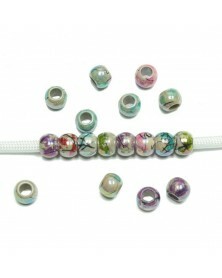 Barrel bead with white awareness ribbon. Fits 550 paracord. Please note price shown is for a single Bead/Charm. Antique Silver Bead stop w/flowers. Fits 550 Paracord. 3.5mm hole when closed Please note price shown is for a single Bead/Charm. Red and Silver Metal Charm. Silver MOM with a diamond looking jewel in the center of the O. Fits 550 Paracord. Please note price shown is for a single charm. Dangling Silver Fairy with Red Jeweled Wings. Fits 550 Paracord. 5mm holePlease note price shown is for a single Bead/Charm. Green fist bead. Fits 550 paracord. Please note price shown is for a single Bead/Charm. 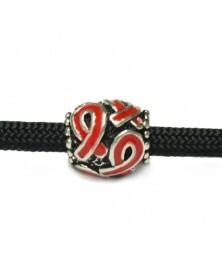 Barrel bead with red awareness ribbon. Fits 550 paracord. 5mm hole Please note price shown is for a single Bead/Charm. 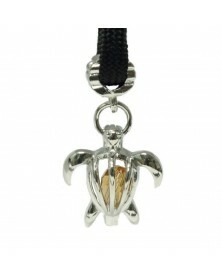 Metal Pineapple Charm. Fits 550 Paracord. Please note price shown is for a single bead/Charm. Barrel bead with Purple awareness ribbon. Fits 550 paracord. 5mm hole Please note price shown is for a single Bead/Charm. Silver metal soccer ball pattern. Fits 550 paracord. Please note price shown is for a single Bead/Charm. 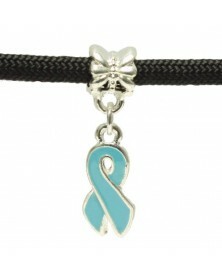 Dangling Light Blue Ribbon Charm. Fits 550 Paracord. Please note price shown is for a single bead/Charm. Dangling Dragonfly Charm with Green Jewels and Green Jeweled Wings. Fits 550 Paracord. 5mm hole Please note price shown is for a single Bead/Charm. 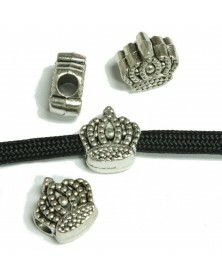 Silver metal bead with baseball stitching pattern. Please note price shown is for a single Bead/Charm. 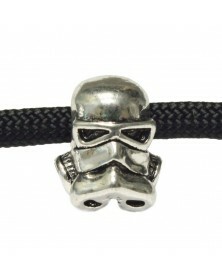 Silver Tone Vaderish Bead. Fits 550 paracord. 5mm hole Please note price shown is for a single Bead/Charm. Two toned copper and silver Robot head bead. Fits 550 paracord. Please note price shown is for a single Bead/Charm. 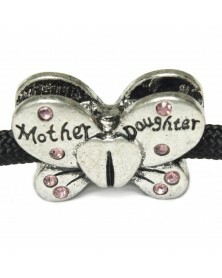 Double sided silver metal pink Butterfly with light pink jewel on top. Fits 550 paracord. Please note price shown is for a single Bead/Charm. Silver double sided Ribbon Charm with Pink Jewel. Fits 550 Paracord. 4.5mm hole Please note price shown is for a single Bead/Charm. Blue enamel Heart shaped Bead/Charm trimmed with Silver. Fits 550 Paracord. 4.5mm Please note price shown is for a single Bead/Charm. Barrel bead awareness ribbon in blue. Fits 550 paracord. Please note price shown is for a single Bead/Charm. 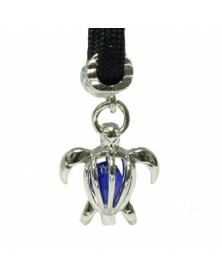 Titanium bead with blue flame design. Measures about 3/8" x 3/8". Hole size 6mm. Please note price shown is for a single bead/Charm. Dangling Purple Ribbon Charm. Fits 550 Paracord. 4.5mm hole Please note price shown is for a single bead/Charm. Round silver spacer bead. Fits 550 Paracord. Please note price shown is for a single Bead/Charm. Silver Stopper Bead with Rubber Inside. Snug fit to 550 Paracord. Hole size about 3.3mm Please note price shown is for a single bead/Charm. Dangling Green Ribbon Charm. Fits 550 Paracord. Please note price shown is for a single bead/Charm. Silver metal lady bug with red, and light pink jewels, double sided. Fits 550 paracord. Please note price shown is for a single Bead/Charm. 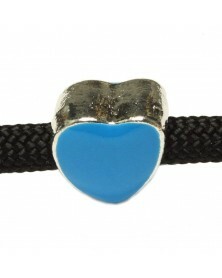 Blue enamel Heart shaped Bead/Charm trimmed with Silver. Fits 550 Paracord. 5mm hole Please note price shown is for a single Bead/Charm. Dangling Silver Butterfly Charm with Diamond looking Jewels. Fits 550 Paracord. Dangling Silver Fairy with Pink Jeweled Wings. Fits 550 Paracord. 5mm holePlease note price shown is for a single Bead/Charm.